Parents, are you playing a game of Whac-A-Mole? If you’re a parent, then suffice it to say you’re well aware of the many challenges that may arise along your parenting journey. Whether it’s potty training your 2 year-old or respect training your teenager, challenges are inevitable. 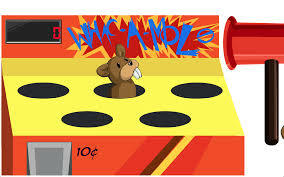 I once heard someone compare parenting to a game of Whac-A-Mole (see pic above). Just when you think you’ve got one mole (challenge) under control, up pops another one. Can you relate? Unfortunately, in our quest to manage the moles, we often fail to assess the effectiveness of our parenting. It’s easy to fall into parenting patterns that are simply a manifestation of the way we were raised, which are sometimes ineffective. As you know, change is never easy. However, in the case of parenting, effective change can literally change the trajectory of your child’s life. I invite you to begin this change process by looking at my TOP 4 parenting tips, and considering how you might make them a reality in your home. The best way to parent is from the inside-out. One of the foundational concepts I teach is the power of the ripple effect. Simply put, everything we say or do creates an invisible ripple for the people around us. Your child is influenced each and every day by the choices you make. Therefore, it’s important that we take a look at ourselves and ask the question, “What areas of my life do I need to change so that I can begin to create a more positive ripple for my child?” One of the prerequisites for change is your ability to be vulnerable. To learn more about vulnerability, click here. We all see life through various lenses, including your child. Helping them to see life through a different lens, when appropriate, is a critical component of their personal development. Unfortunately, the default lens for many is the powerless lens. Essentially, we give our power away to other people and things as a result of our complaining or blaming. For example, when your child complains about their bedtime or the amount of homework they have, it’s important for them to realize that they are trying to control something that is out of their control. For more information on how to change your lens, click here. It’s important to validate your child’s emotions. As a parent, it’s easy to look at our children and wonder why they are thinking or feeling a certain way, which typically comes from a place of judgment, not empathy. Rather than questioning why your child is feeling angry or upset, simply validate it by saying, “I can tell that you’re angry about this.” This statement alone will let them know that you care about their feelings and they will be more likely to open up to you in the future. To learn more about empathic listening, click here. There are countless scientific studies which have proven that gratitude and happiness are directly proportionate. In other words, the more time we spend in gratitude, the happier we become. Make it a daily practice to share gratitude with each other. Whether it’s at the dinner table or in the car on the way to school, modeling gratitude for your child is tremendously powerful. To learn more about the power of gratitude, click here. Please know that attempting to be a perfect parent is akin to chasing the wind. We are all going to make mistakes on this journey. In fact, it’s often the mistakes that guide us in a new, more effective direction. I encourage you to constantly seek opportunities to add to your arsenal of parenting tools and strategies. If you’d like to learn more about my parenting workshops, please email me at mike@kaleidoeye.com. Love this post. I too believe parenting is more inside out. I believe our kids will leave more from who we are as a person, than what we tell them to be. The best way to teach is from example. Love this post! Hi Devon. Thank you for your comments. I couldn’t agree more that WHO we are as parents is so much more important that WHAT we say. I literally crawled into bed the other night thinking about parenting being like Wack-a-mole, only some days I feel like I’m the wacker and other days the mole! Great post.